Known throughout Florida as a wonderful shade tree, the Florida Royal Palm is an iconic palm of yards throughout the southern states. The Florida Royal Palm (Roystonea elata) also known as simply royal palm, is straight from Florida and Caribbean Islands (Cuba and Honduras). This majestic palm tree grows best in direct sunlight with moderate watering. The Florida Royal Palm grows from 40 to 60 feet tall and a beautiful crown of pinnate leaves sometimes over 20 feet diameter. The grey trunk of the Florida Royal palm develops an elongated bulge that sometimes rises to the middle of the tree. 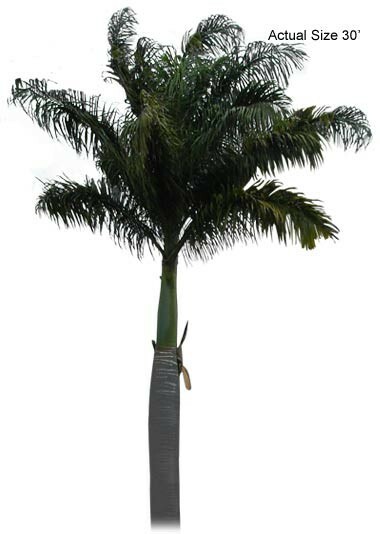 The Florida Royal Palm does best in full sun with well drained soil that is slightly acidic. 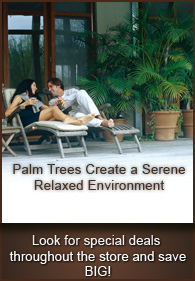 When mature, the Florida Royal Palm is moderately drought tolerant and can withstand brief periods of cold down to 28°F. But it is best grown in frost free areas where it can thrive. With its large trunk and large green spread of leaves, the showy Florida Royal Palm symbolizes the tropics.